Chris Schmidt, a Geophysicist by education, started a graphic design and product company called Studio 13. Located in downtown Houghton (just above Remax). Studio 13 specializes in the sale of prints, t-shirts andcards featuring original designs depicting the local area (Michigan’s Keweenaw) and a range of outdoor sports including cycling and skiing. Keith Atkinson, Lexul‘s Lead Developer, unveiled the company’s custom software solution for employee time logging. While looking for a solution to their own time tracking, the Lexul team decided to use their development experience to build their own and incorporate it with client needs. View their presentation videos here. 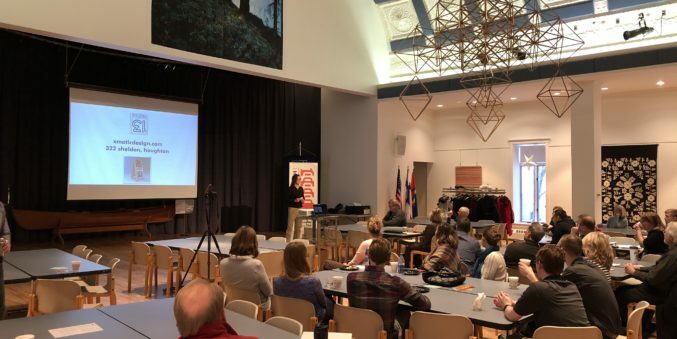 Recurring each month, 1 Million Cups (1MC) invites two entrepreneurs to share their ideas and businesses to receive feedback from the community. Each presenter has 6-7 minutes to pitch, followed by a 15-20 Q&A session. Hot coffee is always served and everyone is welcome to attend. Learn more about the 1 Million Cups Copper Country chapter here.